Seaside Housewife: Animals are sentient beings! If you have being following my blog for a while you will know that I have a plant based/vegan diet. That care deeply for the safe and good treatment of animals and our environment. So you can imagination how many times I have been tagged, messaged and emailed about what is being currently written about in the papers. Who on earth would say that animals cant feel pain or are not sentient??!! I thought I had better raise this issue with my local MP who was on the list sent to me of MP's who voted on this issue. I had heard very harsh things about my local MP Alan Mak, and hadn't spoken with him before. I was a little apprehensive as I waited to talk with him at an open question event. I had a list of questions, from children play parks to if he felt animals where not in fact able to feel pain? I meet people from very different walks of life while waiting and it was clear that he would be dealing with a very wide range of topics! 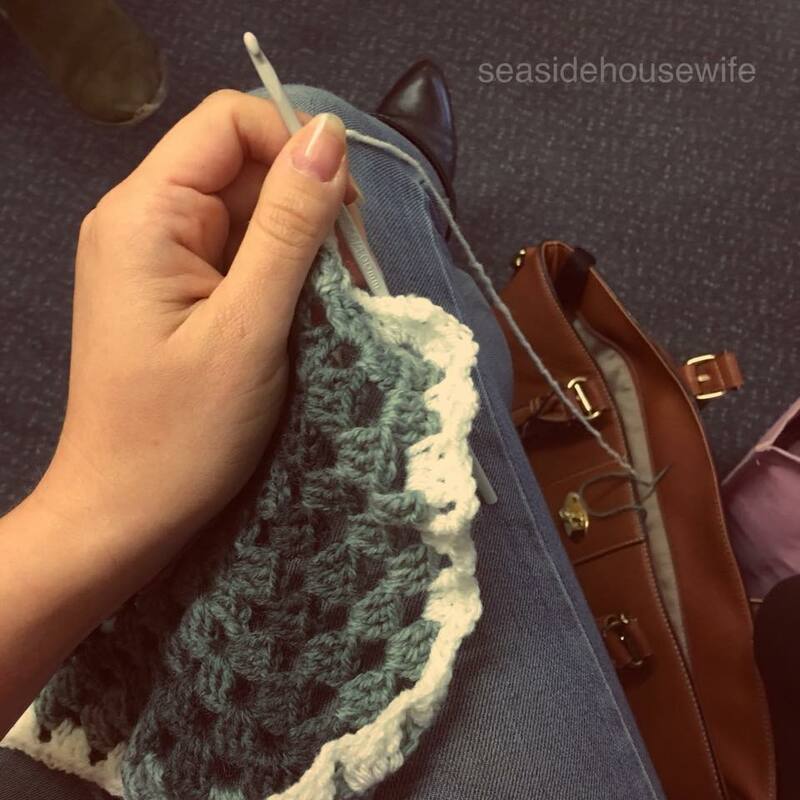 While I waited I got on with some crocheting and thought about the items on my list I wanted to talk to him about. In the meantime a few of my friends emailed their local MP and messaged me their responses. 'Thank you for writing to me about the status of animals as sentient beings. As an animal lover myself I fully appreciate the strength of feeling on this subject. However, the issue of animal sentience in relation to the recent vote is being widely misrepresented by the media and certain campaign groups. 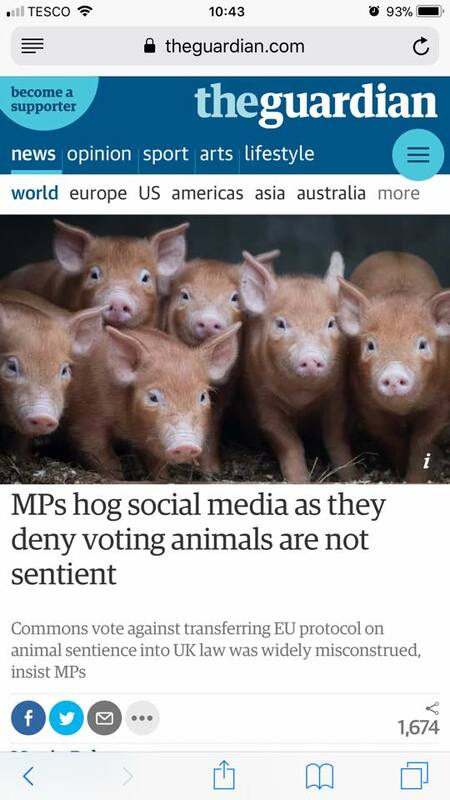 Please be assured that MPs did not vote that animals aren’t sentient – self-evidently they are, and this was not up for debate. Rather, a specific amendment was not considered to be right because it didn't offer the animal protection we enjoy in this country. As such, the Government will deliver a better result using a different route. In the UK we have some of the highest standards of animal welfare in the world – higher than any other country in Europe. 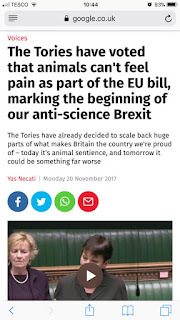 I would also emphasise that EU law is no panacea – sadly, you can keep farm animals in unspeakably cruel conditions without breaking EU law, so this should absolutely not be our benchmark. EU law has not stopped Spanish bull fighting, pig pens in Denmark, Dutch veal farms, French fois gras, beak trimming, fur farming or baby quail hunting. The Government has delivered a series of animal welfare reforms in recent months, demonstrating our commitment to sustaining and enhancing animal welfare protections outside of the EU. 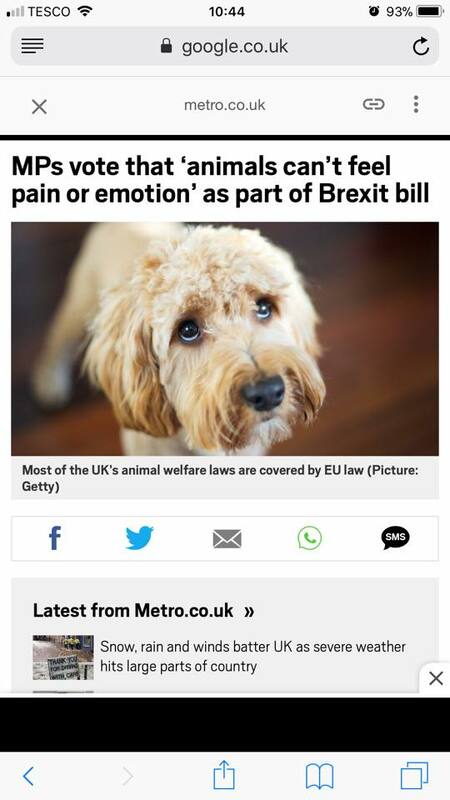 I am confident, therefore, that existing UK legislation, which provides necessary and appropriate protection for animals in this country, will not be weakened when we leave the EU. In Prime Minister’s Questions earlier today, the Prime Minister restated her commitment to enhancing animal welfare standards outside of the EU. So in with my list I went, he was polite and replied to every question I put before him. Giving full time to each question. I was impressed as he not only gave me full responses but also contact details of people who would be able to help with each area in more detail. He believes that animals have feelings, that it would be silly not to think that. That they are sentient beings and can feel pain. This was very good to hear, as it would be a very worrying line of thought to go down that they couldn't. After talking with him, it looked a lot like the papers had got this matter very wrong. 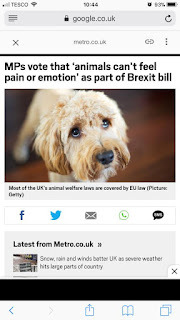 That the government is not trying to remove protection of animal rights but that the UK will bring in its own stronger laws than that of the EU. He mentioned that things like Bull Fighting as still going on, that that would not happen in the UK. As we have stronger and stricter laws in the UK. He also talked about how the UK is bring about other such important matters like banning microbeads, and CCTV in abattoirs to insure better treatment of animals at point of slaughter. I do trust in the UK that it will hold its environmental and animal rights in high regard once we have left the EU. Until we get to that point we wont know for sure. 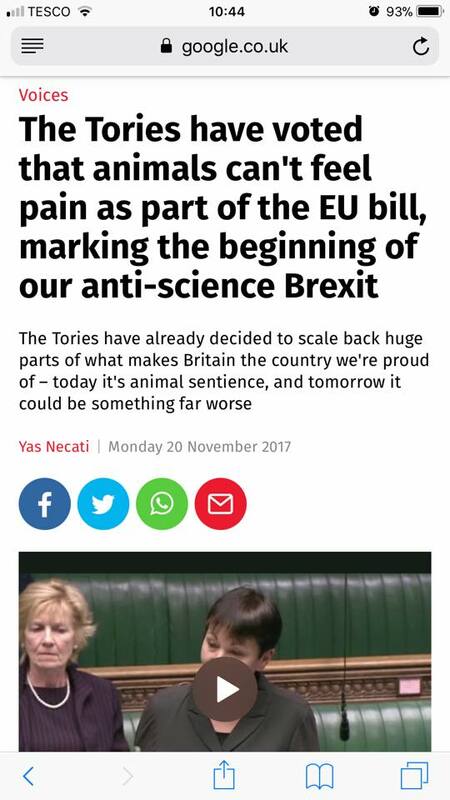 These headlines in the last few days have provoked real fear in the British people, am glad to see so many people fighting for animal rights. I also hope that they think about when they sit down to dinner or what they pick out on the food shop. I have never gone to an open question event like this before. Even though I had heard and read mixed reviews I do feel like he took his time to reply to each of my questions. I left feeling hopeful. I would recommended that you all take a moment from your day to contact your local MP. You may, like me be pleasantly surprised. We am sure, will all be keeping a close eye on what happens next. Am sure we will all band together to endure to support stronger laws to protect our wonderful animals here in the UK. Thank you Alan Mak for your time today. I will update this when I have received more responses from other MP's, if you have contacted yours please comment.